These aren't the the best of quality, but you get the picture. 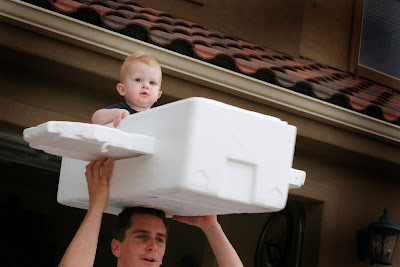 Paul made Zander an airplane out of a Styrofoam cooler a few weeks ago (yes I'm really slacking on posting my pics on time). 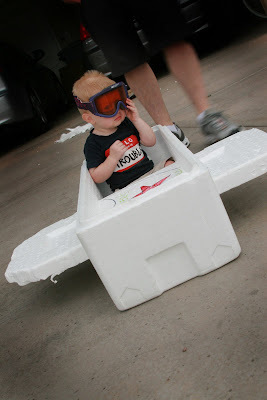 Anyway, he loved flying around our driveway in it. I asked Paul if he would fly me around in it too, but he reluctantly said no (I sulked about it the rest of the night). That is WAY too cute. I love the one with the googles. Paul is so creative. I can totally see him doing this. For some reason this brings back so many memories of Dixie. Like us playing with that entertainment set or something outside for like 4 hours. That is so so cute! You have one cute baby! How cute! You guys are so creative! I am sorry you didnt get to ride. haha. HAHAHA that is just TOO cute:) I love it. 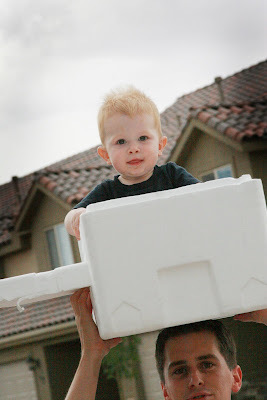 You two are the funnest parents ever, and I love that you always have your camera in hand, what a fun memory. Cute. What a fun idea. Paulie, you're such a good daddy!!! that is so cute Zander looks so serious in that last one like he is really in control I love it! So how are you guys doing? That is one of the cutest things i have ever seen.! He looks like he is taking that ride very seriously.